For the record, the Nigerian goat curry is the truth and the taste never lies. It wouldn't be out of place to say, when it comes to adding intense flavors to soups, stews and curries, goat meat never disappoints. 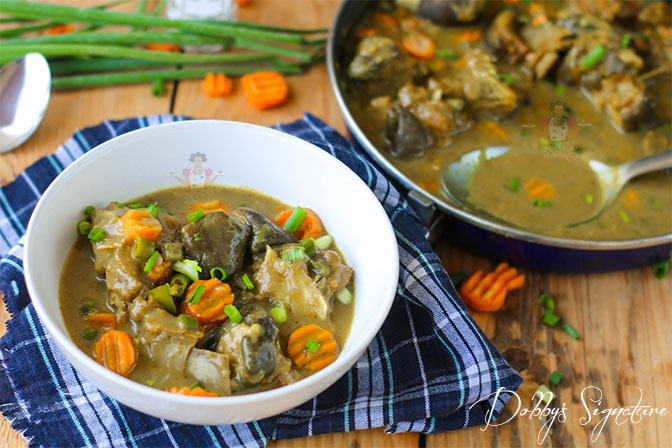 The Nigerian goat curry is a tasty dish made with goat meat stock, seasoned with herbs, slow cooked till tender with all the flavorful juices oozing out of the bone and prepared into a sauce. To turn it into a whole meal, goat meat and veggies are then added - Incredibly delicious. Just as stubborn as the live goat is, one of the cons to cooking goat meat is,it takes an incredible amount of time on the cooker to get tender. 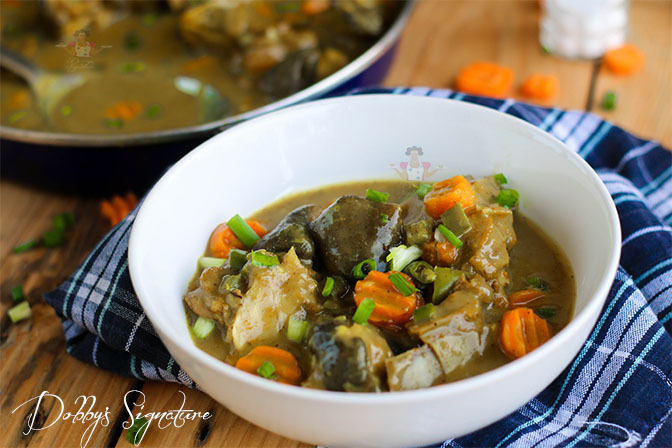 Goat meat never disappoints especially when it comes to adding an incredibly delicious taste to stews, sauces and even soups. You could enjoy this dish with rice, potatoes or yam. 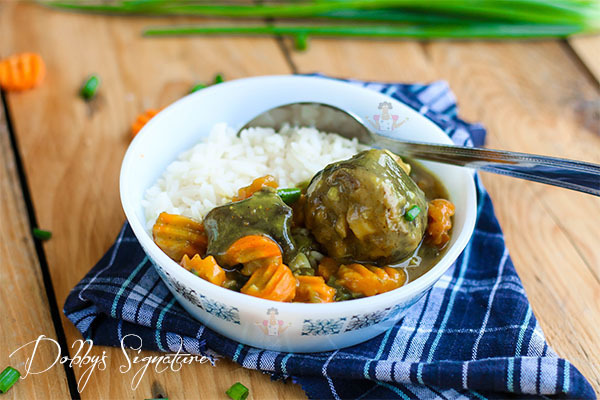 A tasty dish made with goat meat. 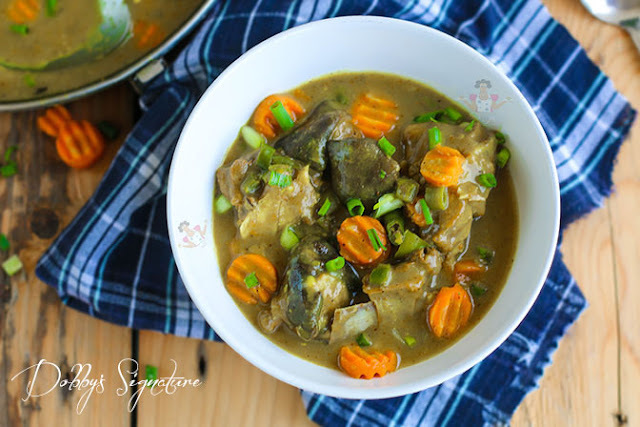 Perfect when served hot with white rice, potato, yam e.tc. Step 1: Rinse and chop the carrot, green bell pepper and spring onion. Set this aside as this would be the last thing to go into the pot. Step 2: Blend the onion and fresh pepper together. Place the goat meat in a medium sized pot, add the pepper and onion blend, crushed seasoning, thyme. Add water, just enough to cover the content of the pot. Cover the pot and leave the meat to cook for about 1 hour 20 minutes while checking occasionally and adding water after 30 minutes to prevent it from drying up while enabling the meat cook further. We want to get the goat meat to a point where it's soft enough and easily falls off the bone. Step 3: About 1 hour into the cooking period, add the salt to taste. It's best to add salt later on because adding salt at the beginning toughens the goat meat thereby increasing cooking period. Add the minced garlic and curry powder then cook further for another 5 minutes. Step 4: Transfer the cooked goat meat into a separate bowl leaving the stock in the pot. Step 6. 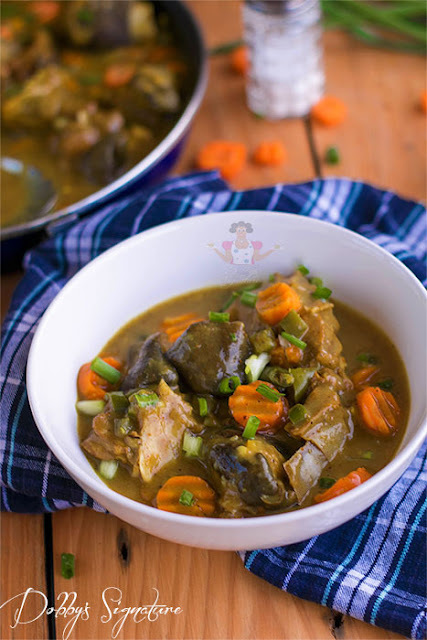 On low heat and while the stock in the pot boils, add the mixture gradually to the goat meat stock, while continually stirring to ensure it mixes properly and does not clump. Leave for about 5 minutes to thicken. You could adjust the thickness by adding more water or more flour mixture. Hi dobby, I follow Urr posts and I must say that you have got great talent plus you hv really helped me spice up my kitchen. Please which camera do you use for Urr pictures and videos?? Thank you Steff. I use a Canon 700D. You could check the shop link above for where to get it. Omo, Dobby, thank you. This is surely a komolole sight o. ah ha! I have seen lovely things I will like to try here. Thank you so much. The first is goat meat curry, then chicken coconut, next is chocolate cake...then others... for a correct foodie like me, and a household with sweet teeth... Thank you. Thank you Joke :). Glad to have you here. From your blog, you have returned the baking desire in me. lol. Glad to here that :). Thanks for teaching me a new dish. Plz what did you do to the carrots to give them that shape. Hi Dobby, thank you very much for all the food and recipes. You are spicing up homes girl. Keep doing what you doing, while I learn and copy.